A traditional ogee style, high capacity profile manfactured to BSEN12200 with a 20 year performance and 10 year colour* guarantee from Gutter Supplies. Ogee Guttering is a popular choice for those looking for something a little different. With its excellent carrying capacity and choice of square or round downpipe systems, it combines the aesthetics of metal guttering with all the benefits of maintenance free PVC. * Covers Black, White, Brown and Anthracite Grey. 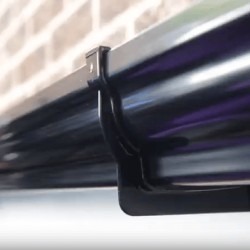 Click here to watch a short video detailing the features and benefits of the Floplast Gutter System. Most developers and homeowners think of Ogee guttering as a decorative system, without realising that it also has another big benefit – it has a high capacity and flow rate. FloPlast’s Niagara Ogee actually has one of the highest carrying capacities of any domestic gutters available in the UK. FloPlast Niagara Ogee Gutter capacity varies between 2.4 litres per second (fixed level with the outlet at one end) and 5.3 litres per second (fixed at 1:350 with a central outlet). We appreciate that these stats can be baffling to all but the scientists and architects, but what this means is that the gutter can hold approximately two and half times as much water as our half round system and more even than our Deepflow Gutter - and as such it can cope with the heaviest flow of rainfall from any large or particularly steep pitched domestic roofs. Because Ogee Gutter is not symmetrical, it is important to understand that stop ends are either left or right handed (a right hand stop end is fitted at the right hand end of a length of gutter when viewed from the front). Similarly, you should remember that gutter angles can be either internal or external (the best way to understand the difference is to look at both product images). Niagara Ogee also features an optional top hung UPVC fascia bracket. 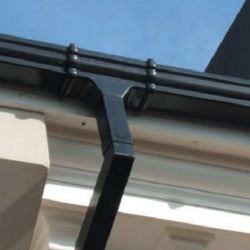 This cleverly designed bracket fits over the top of the gutter and locates inside a small lip on the top inside edge of the gutter profile, removing the need for traditional bottom supported fascia brackets – ideal on a conservatory where you would like to see clean, unspoilt lines. These top hung brackets are currently available in Black, White, Brown and Caramel. 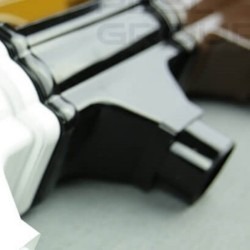 Due to the shaped contour of the gutter seals, FloPlast recommend that all fittings are sprayed with lubricant prior to insertion of the gutters, This keeps the seals clean prevents them from catching as the gutter expands and contracts through the joint. For tips on gutter installations, visit our Ogee Guttering Installation videos and documentation, or access our Guides and Tips tab. IS OGEE GUTTERING RIGHT FOR ME? If you are still not sure whether Ogee is the right system to fit on your house or development, click here to read our own comparison of Ogee with other systems.